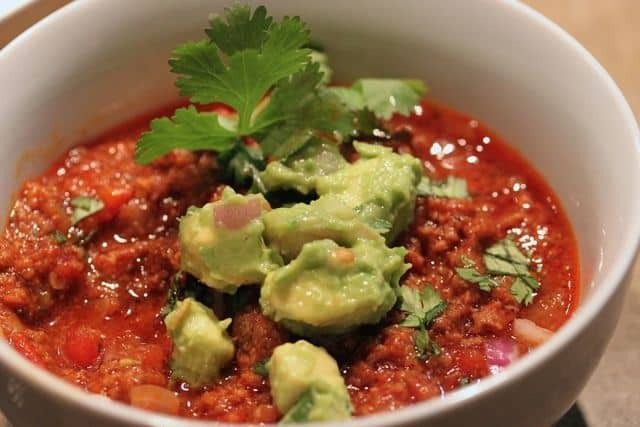 This Beef Heart Chili recipe is by Kathleen Guertin from Robb Wolf’s website. It ranks really well in the weight loss and athletic / metabolically healthy meal rankings due to it’s high nutrient density and low calorie density. Organ meats top the list when it comes to nutrient density, however I haven’t found a lot of recipes using organ meats that rank really well. Perhaps it’s because people feel they need to put a lot of not so healthy things with their organ meats to drown out the taste? This recipe uses heart, ground beef along with a range of spices to build a solid nutritional profile. If you look closely at the chart below you’ll see that I’ve used pork heart as there is no data for beef heart in the NutritionSELF database. Robb has had a massive influence on my thinking, along with many others. I like the way he brings everything back to evolutionary principles that need to make sense in the broader context rather than just looking at isolated studies. I also like the way he promotes quantifying nutritional density as a way to beat the nutritionists at their own game. Robb believes that Mat Lalonde’s nutritional density work will show the nutritionists that Paleo is better than the recommended western diet using their own system! I’m hoping that nutritional density combined with the insulin index component will take things one step further to provide a quantitative basis to demonstrate that one meal is better than another. The details for a 500 calorie serving (the recipe is for two servings) are shown below. This recipe does really well on the weight loss ranking because it has a low calorie density and a solid, great nutrient levels and a solid amount of fibre. If you are insulin resistant or are sensitive to tomatoes you may want to reduce the tomatoes. I’ve re-run the numbers with 5 ounces of tomatoes rather than the 26 ounces in the original recipe. Still not perfectly diabetic friendly, but an improvement and slightly closer to the Bernstein target of 12g carbohydrates per meal. Thanks for posting this. Can you explain how it is only 10 net carbs? I see 63 g carbs with 17 g fiber on your nutrition data analysis, so I’m not following the math on this one. Also, can you link to how you calculate insulin load? I’ve read your site a bit, but haven’t run across that formula. Thanks! The meals shown are for 500 calorie servings. I’ve updated the post to explain this a little better.